In 2008, my daughter started to get interested in religion. Friends at school were attending catechism classes at the local in preparation for their first communion. My daughter wasn’t even baptized. It was with some trepidation, that an agnostic dad, went along to see the local priest about religious affairs. Father B said that my daughter could do the baptism and communion thing in the same package, and it made not a bit of difference that dad himself had been baptized in the presbyterian rites of the Church of Scotland. In 2009, I sat down for a long chat with Bertrand and here is the result that appeared in The Connexion newspaper. Since the inauguration of Pope Benedict XVI in April 2005, the church has never been out the news – a return to mass in Latin, the lifting of the excommunication on four traditional “intégriste” bishops, the relations between church and state – all highly important issues for France’s Catholics. Roughly 51% of French people consider themselves as Catholic. Come Sunday though, only 16% of the population are actually attending mass. A crisis of faith, or pure indifference to the Church? 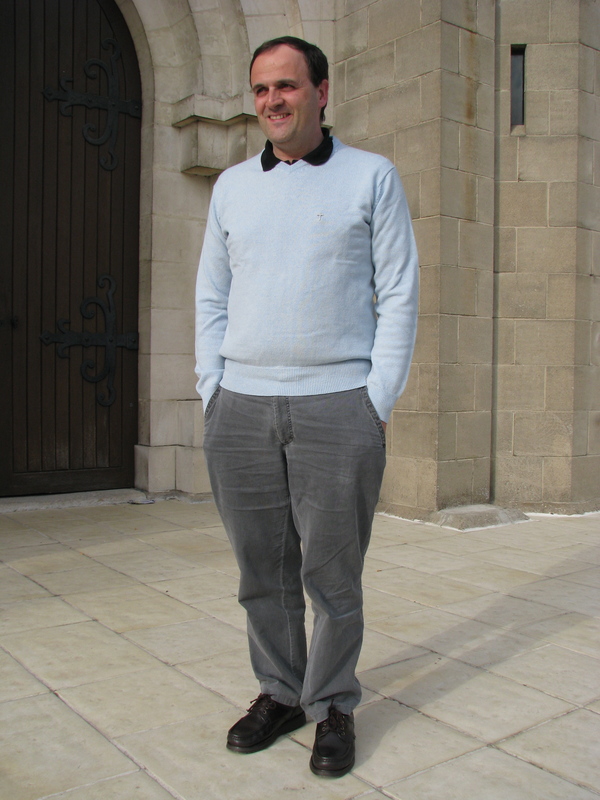 Recently, The I went to talk to Curé, Bertrand Godefroy, about faith in small town France. How are things in your Paroisse? Very good. The church is full up on most Sundays, and I’m very happy here. I think every parish is unique. What differentiates Sacré Coeur from others is the presence of two huge military bases on our doorstep. There are about 20,000 people living in the Parish and our congregation includes a lot of servicemen and their families. I think for this reason we are traditional church, without being traditionalist. I feel particularly honoured to be at Sacré Coeur this year because the parish is celebrating its centenary. You are an urban parish, how are things in the country? In town there are enough priests to attend to the spiritual needs of the population. In the countryside though it is a different story. In villages where there is no priest, the locals have to do it themselves. Paradoxically, this leads to a more innovative and less formal style of mass. Local congregations tend to re-invent the liturgy, to suit their community and its particular spiritual needs. Every profession has its specific nomenclature. What is the correct way to address a “curé” in French? It depends. You can say père or mon père, or quite simply Monsieur le Curé. Why do we refer to God using the familiar Tu form, rather than the more respectful Vous? We used to use the Vous form in prayer, but over the years it has been replaced by Tu. I don’t think referring to God as Tu, shows a lack of respect, on the contrary, it shows that people want to be closer to God, they talk to him as a friend. In English you still refer to God as Thou. How do you become a priest? It takes time. First you need to have the “calling”. Even before the seminary, there is a period of reflection and introspection accompanied by a spiritual mentor. In French we call this a period of discernement. After this comes the seminary, roughly six or seven years of study and preparation. Most corporations in France have their own specific professional qualifications. What about the priesthood? There is no specific diploma saying that you are a priest, and unlike the civil service there is no entrance exam to join the priesthood. Like our public sector colleagues though, we do move around from one tenure to another. A priest can spend between 6 and 12 years in any one parish, anywhere in France. After that he must move on. There is a real malaise in many vocational professions at the moment – low wages and bad working conditions are making many nurses and teachers think seriously about quitting. What about priests? Priests are human too. We are not angels, and though this is not a job like any other, it is still a job and people do leave, though it is a small minority. We are living in hard times. In these uncertain and recession-hit days, are the French turning God. Is there a renewal of faith? We live in a strictly secular republic – l’État laïque. The separation between Church and State is very clear. What are you relations like with the Republic? In very traditional, and unflinching, intégriste, or fundamentalist Catholic circles, there is still a lot of nostalgia for the Ancien Régime. The 1789 Revolution is viewed very much as a cataclysm and a rupture with God and the natural order. However, the vast majority of Catholics are quite happy living within the republican scheme of things. The Republic doesn’t fund any religion, but it does guarantee the right of every citizen to exercise his or her religion in complete freedom, which hasn’t always been the case in France. I think the best living proof of this constitutional right can be seen by the chaplaincies, or aumôneries which are established within many state-run institutions such as schools, prisons or hospitals. What about relations between religions themselves. Do you get on with the local Imam? Nowadays there is a lot of talk about friction between Islamic and Christian communities, On the whole in Bourges, relations are cordial. When the new Mosque was opened in the north of town a couple of years ago, the local priest was invited along to the inauguration. Mind you the same priest later had his car burned and stones were thrown at the church. Whether this was radical Islamic groups, or just bored teenagers having « fun », I can’t say. What about other religious communities? The Mormons come round on a regular basis and try to convert us. What about the image of the modern church? I think at best most people are indifferent to the church, either that or they consider us as unfashionable. We are a long way from the vehement anti clericalism of our forebears. 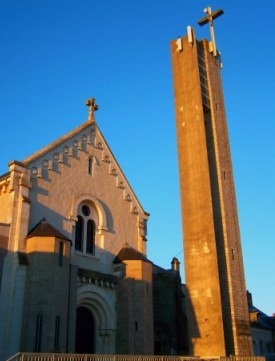 In France only catholiques got to church or l’église. Protestants go to le temple, exactly like Bouddhistes who also go to temples. There are 100,000 Catholic places of worship in France, 50,000 of them are churches. Protestants have 2000 temples and the nation’s 5 million Musulmans worship in Mosquées, of which there are 1900. Jews or Juifs have 280 synagogues. France is an l’État laïque – a secular state Church and State have been seperated since 1905. The state does not legally recognize any religion, however it acknowledges all, and the constitution guarantees every citizen the right and freedom to practise his or her chosen faith. America is also a republic, but religion plays an important part in daily life. Barak Obama’s inaugrution speech was peppered with religious references, and Mr Obama swore an oath on the Bible. Unthinakble in France, where the Republic is designed as bulwark against the Church, protecting thet State an dits citzens from the excesses of religion. Across the Atlantic, the separation of Church and state is actually designed to protect the Church. Religion has no place in public life, it is not taught in school and the wearing of « ostentatious » religious symbols is banned in schools and other public places. This sounds very austere, in everyday terms though, it simply means that the plethora of exotic religious headgear worn everyday by workers in the UK is not tolerated in France. In a post office, a tax office, even a supermarket, you will never be served by staff wearing headscarves or turbans. There is one rule for all, schedules, uniforms, working practises – none are adapted to suit individual religious requirements. It is very much a case of « like it or lump it. » In the nation’s schools, the history world religions features on the curriculum, however if children require religious instruction, or catéchisme, that is dispensed out of, and after school at the local church.